It’s cold outside and the bloom has faded from your garden but there is still a surprisingly large range of veg that’s at its best at this time of the year – think root veg like carrots, parsnips and turnips; brassicas such as broccoli, sprouts and cabbage; and don’t forget potatoes – roasted, mashed or chipped, the humble spud is the mainstay of so many meals. Eating seasonally is good for you and good for the planet. You can enjoy food at its freshest, food miles are greatly reduced and it’s usually better value. So what’s in season now and what can you do with it? Have a look at the ideas below. Love ‘em or hate ‘em, Brussels sprouts are everywhere now. Forget boiling them for ages until they go grey and smelly and the goodness has gone. Try slicing them thinly and sautéing with garlic and bacon and maybe add a sprinkle of chilli flakes to add a touch of warmth. Or boil them for 4 or five minutes, cut them in half and fry gently in a bit of butter with some chestnuts (also in season now). 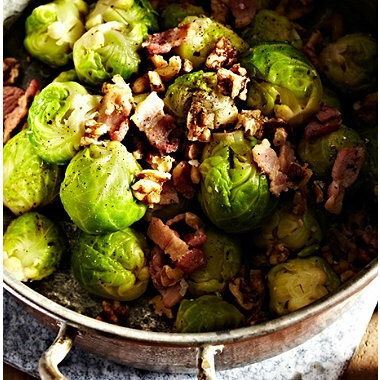 Any leftover sprouts can be chopped up and used in bubble & squeak. You might just be surprised at how delicious this much maligned vegetable can be. Comfort food is king in the colder months. Belly-warming soups, potato-topped hot pots, slow-cooked stews and casseroles and the good old Sunday roast are the order of the day, and all will benefit from generous portions of winter veg. Soup: so good for you and so easy to make, especially if you use a soup maker. Just chop up your veg, chuck it in and the machine does the rest while you get the bowls ready. 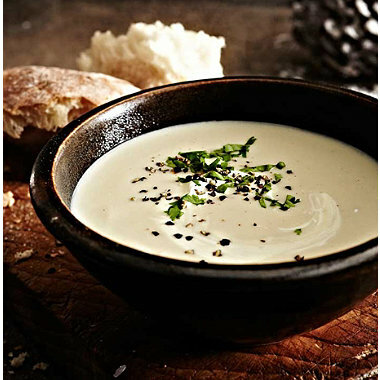 It’s a great way to use seasonal veg – try Cream of Celeriac (celeriac is in its prime in the winter months), or a hearty Mushroom Soup. Soup freezes well too so is ideal for cooking in bulk then freezing in Soup & Sauce Bags for another day. As mentioned earlier, the potato is so versatile. Fish and chips, bangers and mash, boiled and tossed in butter and black pepper, as a topping for shepherd’s pies and hotpots, whizzed up into soup (try our Cheddar and Potato Soup with Bacon), or baked until crispy-skinned and fluffy-fleshed in the oven, potatoes lend themselves to any number of tasty uses. When it comes to mash, you needn’t confine yourself to spuds. How about carrot and swede or butternut squash and nutty celeriac for tasty alternatives? You could also use mashed veg in place of roast potatoes if you want to make your Sunday roast a bit healthier. We haven’t even talked about cauliflower, parsnips, cabbage, kale and Jerusalem artichokes; all at their best in the cooler winter months and a rich source of flavour and nutrients in any number of dishes. Take a look at our recipe section where you’ll find lots of recipe ideas to help you make the most of winter’s bounty.